A journey by train to Khaiyachora waterfalls - oh are you kidding me. No, I am not kidding. I will show you how you will make a journey by train to Khaiyachora waterfalls. It was an amazing journey. Note that I am using 'waterfalls' after the name of Khaiyachora, do you know why? Maybe you know but I am repeating that - there is nine steps waterfall there. This is call cascades. If you become able to travel all the cascades it will a great adventure. Obviously, you will visit all the cascades, unless you will miss a lot of things. 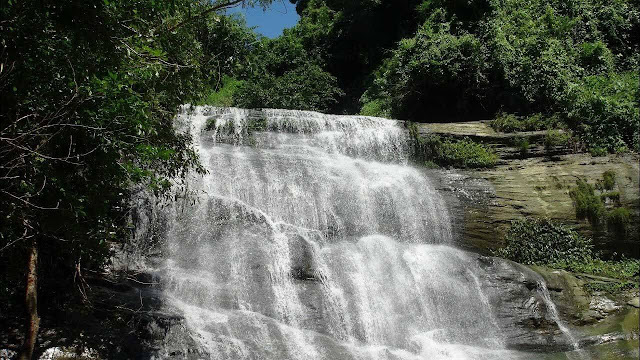 However, before going in depth of Khaiyachora waterfalls lets back to its history. This waterfalls has become more popular just a few years ago and did not exist only fifty years ago. How it was created and when it was created there is no exact information found over online but its age is around fifty years or something more or less. However, due to offensive and tough route, these waterfalls were unknown to the people of Bangladesh. People say it was created after a heavy mountain ridge. In 2010 Bangladesh govt. has declared Khaiyachora waterfalls as a national garden or 'National Uddan' means a natural space where the hunters are not allowed and the animals and species should be protected by the govt. authority. This is a place of Khaiyachora Union, Mirsharai Upozilla, Chittagong. 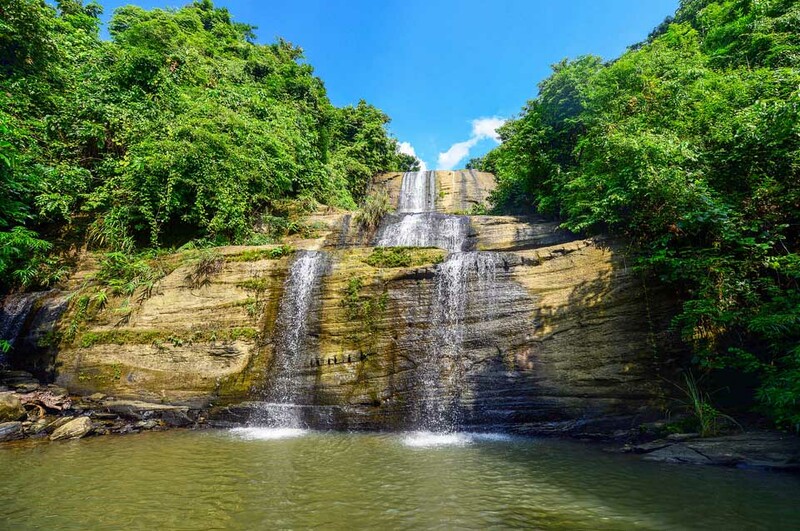 The waterfalls are around 4.2 Kilometer's away from the Dhaka-Chittagong highway. we will discuss a lot about it later. yes, maybe you fell bored why I am talking this is a Journey by train and it is really a cheap tour also. How much cheap? You can't imagine how much cheap it is. This is the most fun part of the adventerous journey. yes, the adventureous journey always little bit hardworking and painful as well. But if you take as a challenge then it will be really enjoyable. So first of all set your mind you are going do something adventurous and it will not an easy task. Get your backpack and go to Komlapur railway station. There is a train from Dhaka to Feni, it starts its journey at around 10:30 PM. Try to reach little bit earlier buy a ticket and manage a seat. Some expert travelers say's if you reach to the station before 9:00 PM you may get a seat. So reach earlier buy the ticket and then not getting late to the station seat tight to the train. Keep in mind that this train is local type train and keep stoppage in several railway stations. However, getting a seat is very important to make your journey more comfortable and have a sound sleep at night. Ticket price to the local train from Dhaka to feni is around 90 taka and its about six hours journey. You will reach to Feni at 6:00 Am around. Then you may complete your breakfast nearby to Feni railway station. From Feni to Khaiyachora there is a demo train service from Feni railway station. Ticket fare only 20 BDT. It's about half an hour journey. yes, from Khaiyachora station after walking few minutes backward through the rail line you will find the track of Khaiyachora track. The first cascade of Khaiaychora waterfall is not so far. Don't forget to buy a bamboo stick before starting your journey through the Khaiyachora waterfalls track. This is how you can you can reach to Khaiyachora waterfalls by train. You can use the same route during back to Dhaka. Have you calculated how cheap the journey was? Your road expense is only around 220 BDT. There is no reputed hotels or restaurants in that area but some restaurants obviously by the local villagers. The shops and restaurants are upgrading day by day and quality of foods increasing. Don't forget to keep a stick. You should use such type of shoes is possible to use in water and must have back belts. It will help you to walk properly to the toughest track and climb to the mountains. The track is muddy and slippery so be careful. Have a nice journey to Khaiyachora waterfalls.